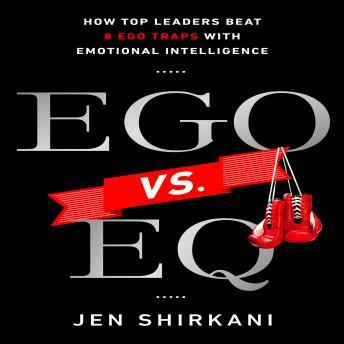 In Ego vs. EQ, Jen Shirkani shares strategies for using emotional intelligence (EQ) as a primary prevention tool to avoid career derailment. The executive leadership failure rate is high: two in five CEO's fail in the first 18 months on the job and two thirds of business' will disappear just a decade after founding. This book teaches you how to identify the most common reasons for leadership ineffectiveness, including the cascading consequences they create, and learn tools to prevent them. Drawing on real-life anecdotes from the author's 20-years of coaching and consulting, Ego vs. EQ provides research and case study examples in an easy to understand, practical format and is ideal for anyone currently in an executive leadership role, including business owners, or those wanting to become a dynamic future leader. Gildan Media and Bibliomotion are proud to bring you another Bibliomotion Audiobook. Featuring exceptional content for today's listener, these notable audiobooks contain the essential tools that can be applied to every facet of your life.